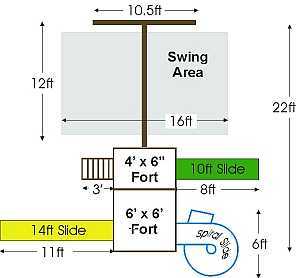 The Adventurer Swing Set / Fort Kit features a large two level fort. The lower deck is 5 feet high, and the upper deck is 7 feet. The lower deck measures 4ft. X 6ft., and the upper deck measures 6ft. X 6ft. 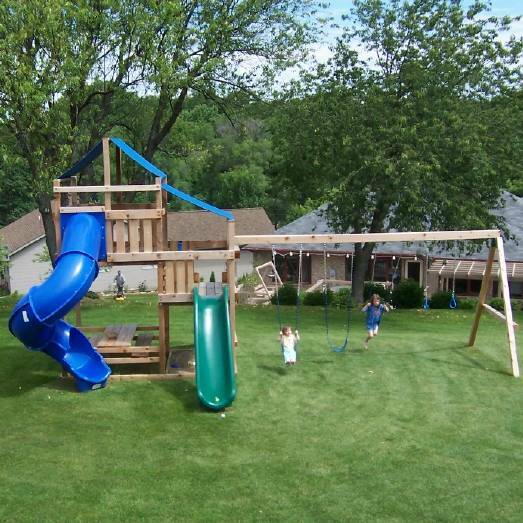 The Adventurer Swing Set is easy to modify and can accommodate nearly any type of playset slide. 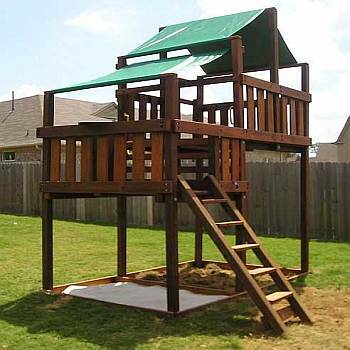 This unique, one of a kind, wooden fort / swing set is solidly designed and engineered. Its unique design and Bolt-Thru construction offers exceptional strength and requires less lumber and less time to construct. This solid swing set structure is supported by six 4x4s. The deck boards are 2x6 lumber and can easily support the weight of several adults. The entry ladder is inclined 30 degrees for safety and is made from 4x4 rails and large flat 2x6 rungs and NOT round slippery hazardous rungs like other kits. Our Adventurer Wood Playset offers both a typical 5ft high deck for younger children and a 7ft high deck for larger slides for continued challenges as they become older and bolder. You can add one or more slides in combinations of 10ft, 14ft, or even a Super Spiral Slide! A swing beam will mount 8 feet off the ground, can be attached to any open side of the lower deck, designed to go off a 4x6 rail, and it can be owner customized for 2, 3, or 4 swing positions. 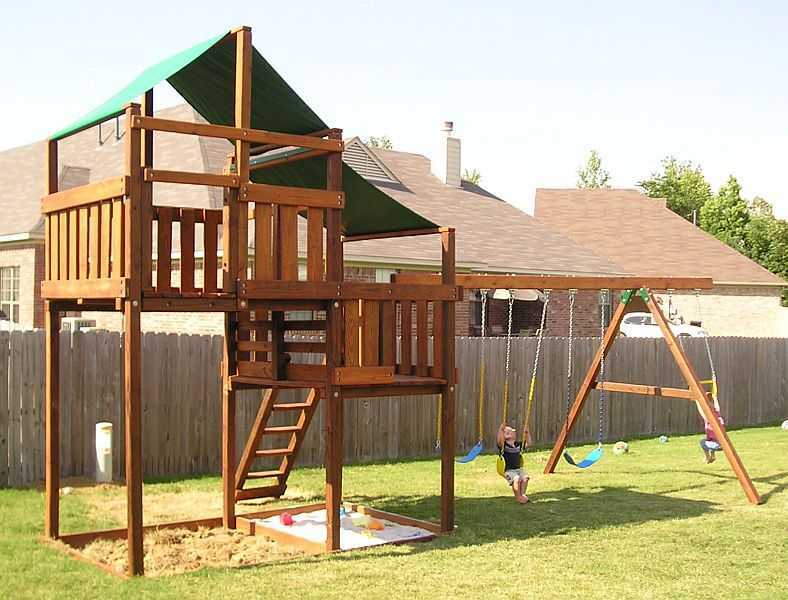 This Adventurer playset with Fort is a perfect Do-It-Yourself Wooden Swing Set project. With a little patience and a few hand tools, you can build an amazing Adventurer Swing Set / Fort for your children. Approximate build time is 16-20 hours. We recommend a six foot safety-zone perimeter around our playsets (3 feet minimum). 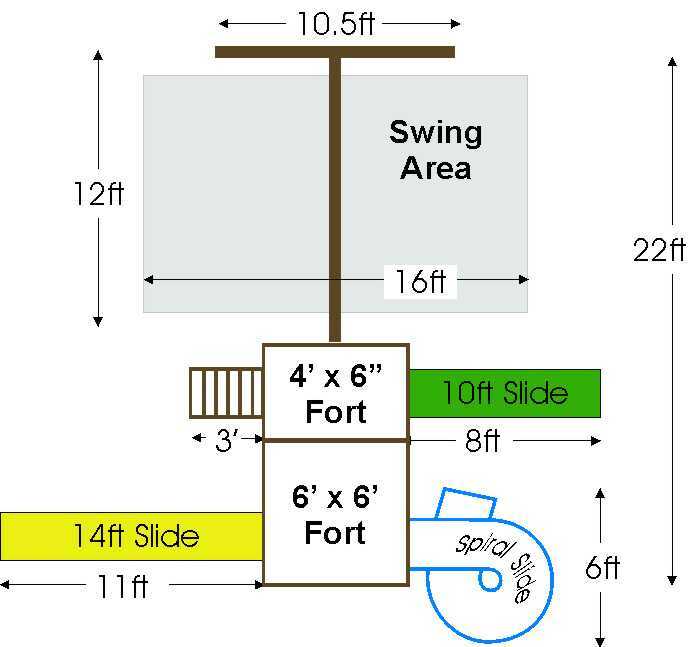 Step-by-step, 3D illustrated manual to build the Adventurer Swing Set / Fort with sandbox bottom, and a 3 swing position swing beam and A-Frame support assembly. Swing beam can be modified for 2, 3 or 4 positions, and/or add a tire swing event. Heavy Duty Iron Ductile Swing Hangers that give your swing set that Herculean look instead of the standard single Bolt Swing Hangers. These hangers are much more durable and recommended for heavier loads. Customize your swing set by choosing from Belt swings, Trapeze & Rings, Full Bucket, Half Bucket, Buoy Ball, Glider, or any other swing set add-on. Hot-Dipped Galvanized hardware for superior outdoor rust and corrosion protection. 130% thicker coating than less protective zinc plated hardware. Exchange one or more belt swings for a different type of swing: Half Bucket, Full Bucket, Trapeze/Rings, Daisy Disc, Buoy Ball, Glider, etc. The Adventurer was designed for one or more slides (not included) and taller slides for older children . It can even easily accommodate the awesome Popular Spiral Slide! Check out our assortment of Playset Slides. Orders with slides will ship together via motor freight shipment.